Seriously, who else would make it a reality to buy a lipstick for the same price as bus fare into town other than NYC Cosmetics? 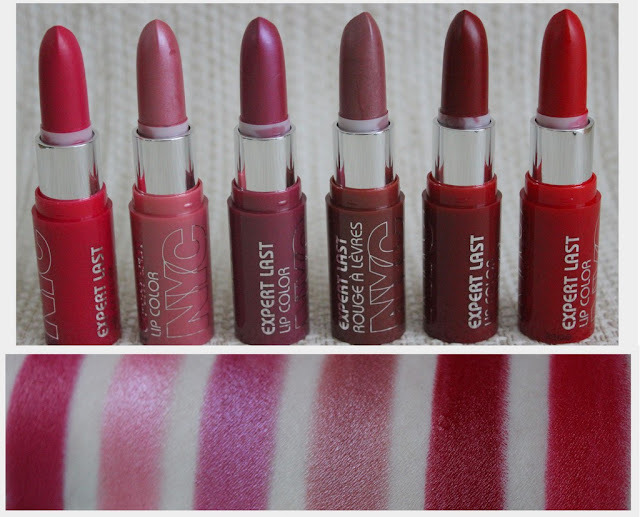 €2.49 is the damage for one of these highly pigmented lipsticks, that's nothing! I was sent six of the fourteen available shades to play with and had fun trying them all. The great thing about affordable products like this is that you can try out shades you mightn't normally wear without breaking the bank. I loved Air Kiss, Red Rapture and Traffic Jam which is surprising considering I'm usually scared of bold colours like this. They had a gorgeous satin finish that is more flattering than the frosty metallic finish of Snowcone, Purple Crush and Sugar Plum. Each shade has great colour payoff, frosty and otherwise, and have a fruity scent that I like. They last a couple of hours before needing to be retouched. I'll definitely be checking out the remaining shades in the range the next time I'm at an NYC stand. I'll just leave the frosty ones to the lovers of the 80s and I'll stick to the satins! A definite budgetary winner NYC! I love the look of Sugar Plum!